LONDON (Reuters) - Global shares hit their highest levels in five months and the dollar dipped on Monday, as traders began to price in the likelihood of the U.S. Federal Reserve sticking to an accommodative stance at its policy meeting this week. European markets extended a run of gains, helped by a jump in shares in German lenders Deutsche Bank and Commerzbank after they confirmed over the weekend that they were in talks to merge. 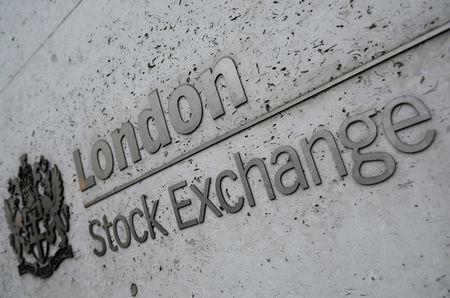 Britain's FTSE 100 outperformed its European peers with a nearly 0.7 percent gain at the start of a week that could see parliament voting for a third time on Prime Minister Theresa May's Brexit plan after ruling out a near-term no-deal exit. MSCI's All-Country World index, which tracks shares in 47 countries, was up 0.3 percent on the day. The index set a five-month high, hitting its highest since Oct. 10. With signs of global economic growth slowing, traders were focused on the Federal Reserve, which meets on Wednesday for clues about the likely path of U.S. interest rates. In particular, traders will be focusing on whether policymakers have sufficiently lowered their rate forecasts to more closely align their "dot plot", a diagram showing individual policymakers' rate views for the next three years. Also expected is more detail on a plan to stop cutting the Fed's holdings of nearly $3.8 trillion in bonds. The two-day meeting ends with a news conference on Wednesday. Yields on three- and five-year Treasuries are dead in line with the effective Fed funds rate, while futures imply a better-than-even chance of a rate cut by year end. The dollar index was lower 0.2 percent at 96.397, after having shed 0.7 percent last week. "The market will be scrutinizing the extent to which the Fed scales back its interest rate forecasts," said Rupert Thompson, head of research at UK asset manager Kingswood. "The Fed is very likely to remain on pause for a good few months yet. But what is less clear is whether the market is right to assume that not only will there be no further hike at all but rates will actually be cut next year." Data on Friday showed U.S. manufacturing output fell for a second straight month in February and factory activity in New York state hit nearly a two-year low this month, further evidence of a sharp slowdown in economic growth early in the first quarter. A marked decline in Treasury yields has dragged on the dollar, leaving it at 111.53 yen from a top of 111.89 on Friday. The euro was 0.3 percent higher at $1.1357, well up from the recent trough of $1.1174 which was hit when the European Central Bank took a dovish turn of its own. The pound was down 0.25 percent at $1.3264 as lawmakers cast doubt on Prime Minister May's third attempt to get parliament to back her Brexit deal. May has only three days to win approval for her deal to leave the European Union if she wants to go to a summit with the bloc's leaders on Thursday with something to offer them in return for more time. "The main event this week is Brexit, and signs are converging that something has to happen either way. The headlines suggest people are coming on board and it sounds like the DUP (Democratic Unionist Party) is probably going to back it," said David Slater, portfolio manager at Trium Capital. "The vote is only going to happen if Theresa May has a realistic chance of passing. However it pans out, (an agreement) will be sterling-euro and FTSE bullish." Slater added that if May's deal passes, he could see pound-euro above the 1.25 mark and the FTSE up 5 percent in a month after a good Brexit outcome. In bonds, no news proved the most important news in euro zone bonds on Monday after ratings agency Moody's decided not to downgrade Italy's credit rating, prompting investors to buy Italian government bonds. Italy's 10-year government bond yield fell as much as four basis points on the day to 2.46 percent, its lowest since May 2018. Its spread over higher-rated Germany briefly narrowed to its tightest since September 2018. In commodity markets, spot gold rose 0.2 percent to $1,304.35 per ounce. Oil slipped to around $67 a barrel, weighed by concern that an economic downturn may dent fuel consumption, despite the prospect of prolonged OPEC-led oil supply curbs.